Jacob W. Pfeifer-Johnson "Jake" passed away on January 17, 2019. He was 24 years old. He is the beloved son of William J. Johnson and the late Jessica Pfeifer. Cherished grandson to his "Mingle" Caroline Johnson and the late Frank Johnson, Edward Pfeifer, and Linda Hurd. Dear brother of Danielle Johnson, Ryan Johnson, Joseph McAnally, and Nicole Bowers. Loving nephew of Frank Johnson (Celeste), Anthony Johnson, Kathleen Bennett (Glenn), and Missy Kulb (Michael). Sadly missed by his cousins Matt, Eddie, Madison, Michael, Linda, Kennedy, Maria Elena, his stepmother Emily McAnally, and his extended family. Jake will be missed tremendously by his family and friends. 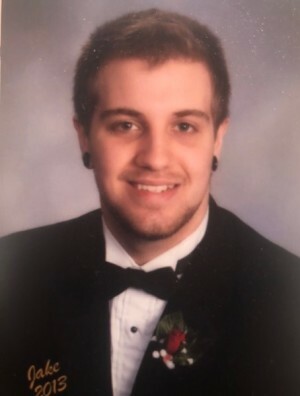 He will be remembered for his huge heart, his love of music, especially playing rock on his electric guitar, motorcycles, and the Philadelphia Flyers. Relatives and friends are invited to celebrate his life at his viewing and funeral Thursday January 24, 2019 beginning at 10am in the McElvarr Funeral Home 1415-17 E. Susquehanna Avenue Philadelphia PA 19125 (Fishtown). Funeral service 12pm.